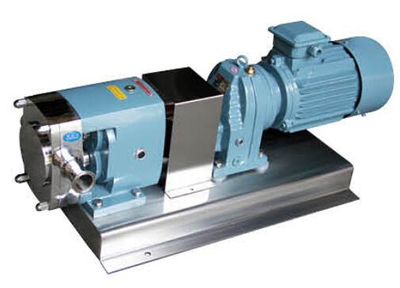 Rotor pump is also named rotary lobe pump, three lobe pump, sole pump, etc. When the 2simultaneous reverse rotating rotors (with 2-4gears) revolve, it produces suction force at the inlet (vacuum), which intakes the material delivered. 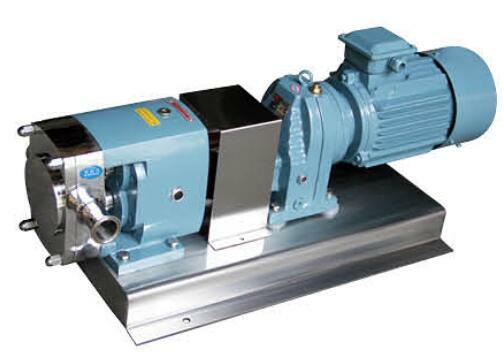 Rotor pump is also named rotary lobe pump, three lobe pump, sole pump, etc. This is called Gear Constant Speed Ratio Rotor Pump. When the 2simultaneous reverse rotating rotors (with 2-4gears) revolve, it produces suction force at the inlet (vacuum), which intakes the material delivered. 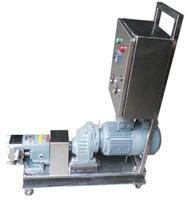 Transmission type: motor + fix velocity ratio speed reducer; motor+ mechanical friction type stepless speed variator; frequency conversion motor + frequency converter. Available motor: single wing, double wing, tri-lobe. Gasket: Sillicon, EPDM, PTFE, Viton, etc., depending on medium. Mechanical seal: Silicon-carbide, graphite-ceramic, etc. Application: Food and beverage, fruit concentrates, paste products, cosmetics, medicine, chemical industry and others. Our special alloy allows for the smallest clearance between rotors and casing. Incredibly easy assembly/disassembly. Completely cleanable and sterilizable with CIP/SIP processes. Precision pump – a high rigidity is reached by shortest distance between bearing and rotor.